Dr. Jim Willbanks retires after 26 years service at CGSC | Command and General Staff College Foundation, Inc.
Dr. James Willbanks, General of the Army George C. Marshall Chair of Military History for the Command and General Staff College was honored in retirement ceremonies at the Lewis and Clark Center April 24. Willbanks career dates to 1969 when he was commissioned a lieutenant of infantry after graduating from Texas A&M University. 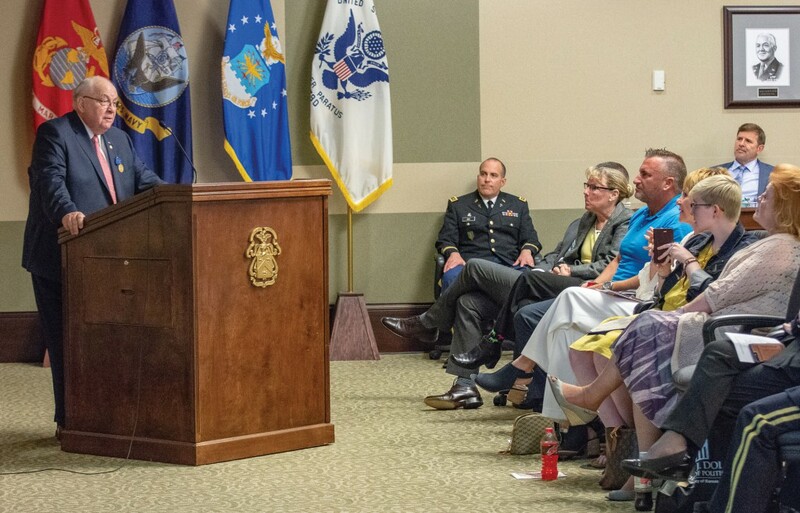 Dr. Jim Willbanks addresses family, friends and colleagues during his retirement ceremony on April 24, 2018 in the Arnold Conference Room of the Lewis and Clark Center. His early military career saw him earn awards for valor in Vietnam and documenting that conflict has been is life-long calling. Willbanks retired from military service in 1992 and began his second career as a civilian instructor at CGSC. Earning his doctorate in history from the University of Kansas, he rose to become the director of the Department of Military History at CGSC. “This is the best military history department in the whole country,” he said. He served as both the director and Marshall Chair holder before stepping down as director to devote his attention to research and writing the past two years. He said serving as the Marshall Chair gave him time to research, write, speak and think about military history. Foundation President/CEO Doug Tystad presents a child-sized College Chair to Dr. Jim Willbanks, drawing laughter from everyone in attendance during Willbanks’ retirement ceremony April 24. Upon retirement Willbanks was named Professor Emeritus. He is the eighth person to earn that honor from CGSC. He said he was honored to have served and charged his faculty teammates with maintaining the sacred trust of educating and training young field-grade officers who will go on to lead the Army. 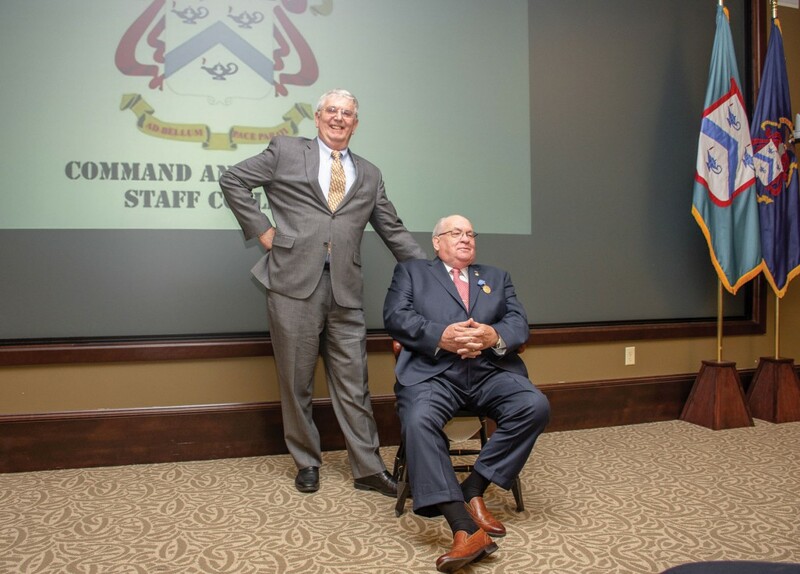 After a few laughs with a child-sized chair, all is right in the world again as Dr. Willbanks lays claim to his actual full-sized chair presented by the CGSC Foundation in recognition of his selection as CGSC Professor Emeritus. 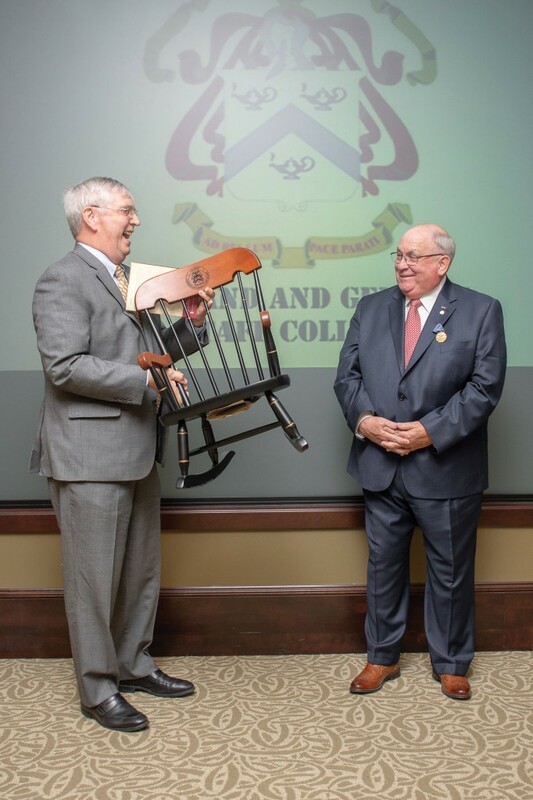 In recognition of his selection as CGSC Professor Emeritus, the Foundation presented Willbanks with a CGSC College chair, but not without having a little fun with him initially. The first chair Tystad unveiled was a child-sized rocking chair version which drew a few laughs, even from Willbanks. After a good chuckle, Tystad presented him with the actual chair, a gift the Foundation presents to every selected emeritus professor. Dr. Willbanks is a decorated Vietnam veteran who has been on the CGSC faculty since 1992, when he retired from the Army as a Lieutenant Colonel with 23 years’ service as an infantry officer in various assignments, to include a tour as an infantry advisor with a South Vietnamese regiment during the 1972 North Vietnamese Easter Offensive. An honor graduate of the Command and General Staff Officers Course in the Class of 1983, Dr. Willbanks was a member of the first School for Advanced Military Studies (SAMS) Class the next year. Prior to assuming the Marshall Chair, Dr. Willbanks served as director of the CGSC Department of Military History for eleven years. He holds a bachelor’s in history (1969) and a master’s in management (1979) from Texas A&M University, and a master’s (1992) and doctorate (1998) in history from the University of Kansas. Dr. Willbanks is the author or editor of sixteen books, including A Raid Too Far (Texas A&M Press, 2014), Abandoning Vietnam (University Press of Kansas, 2004), The Battle of An Loc (Indiana University Press, 2005), The Tet Offensive: A Concise History (Columbia University Press, 2006), and Vietnam War Almanac (Facts on file, 2009). He and his work have been highlighted in media such as the New York Times, Los Angeles Times, US News & World Report, Wall Street Journal, Army Times, Stars and Stripes, and on PBS television. He served as a consultant to producer Ken Burns in the production of a 10-part, 18-hour documentary on the Vietnam War for PBS, which began airing in the Fall of 2017. Dr. Willbanks’ military awards and decorations include the Silver Star, Legion of Merit, Bronze Star with “V” and Oak Leaf Cluster, two Purple Hearts, and the Vietnamese Cross of Gallantry with two Silver Stars. 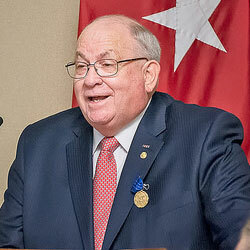 He is affiliated with numerous academic and military-related organizations, to include the Society for Military History, United States Commission of Military History, Army Historical Foundation, National Strategy Forum, Phi Alpha Theta, Association of the U.S. Army, Command and General Staff College Foundation, Military Order of the Purple Heart, and the Texas A&M University Association of Former Students. Dr. Willbanks retires after forty-nine years of combined federal service. He and his wife now reside in Georgetown, Texas. The CGSC Foundation board of trustees and staff wish Dr. Willbanks and family well as they begin this new chapter of their lives. “Well done,” as has been said and quoted for several hundred years, surely is the simplest, and most deserved salutation we can offer. Visit the CGSC Flickr album for more photos from the ceremony. My question would have been, Why didn’t Nixon revive the plan developed by Westmoreland to cut Laos in half from Lao Bao to Savannakhet along Highway 9 rather than doing the Cambodian Incursion? My opinion: The Chinese and Russian fear is a red herring, since the Vietnamese hate the Chinese (who had their own problems at the time,) and the Russians didn’t have the logistical capacity to counter what would have been a fait accompli before they could have gotten out of the starting blocks. Thanks for the reminder of my service there from mid 1970 to early 1975.